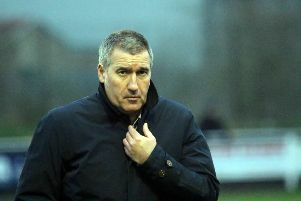 Banbury United boss Mike Ford is looking for his side to retain their mental approach for another test on the road. The Puritans head to Royston Town for Saturday’s Evo-Stik League South clash looking to make their point again. With last weekend’s premier division central fixture with Redditch United being postponed, it means United will be on the road for three games running as they make the long trip to Lowestoft Town the following weekend. Ford said: “We went to Rushden & Diamonds with a good mentality, to protect the point we had before the game and come home with it in the worst case. Following the trip to Royston, the Puritans face Easington Sports in the last eight of the OFA Senior Cup on Tuesday. But Ford wants to make sure his squad focuses on Saturday’s game as they look to extend their good run. He said: “I know they’re mid-table but I’m sure Royston will go on a good run at some stage so I just want it to be after we’ve played them on Saturday! “We’ve got a good balance to the squad now, we’re playing well and we’re in a good place at the moment. “I’m happy with this group of players, in hindsight, I may have changed things too soon earlier in the season. “You are always looking to push your team on so when you get a couple of defeats you start to question your judgement and the players.